Once a baby sea turtle hatches from its egg, the lure of the ocean is immediate; hatchlings make the trek from their nest to the water within the first 24 hours, in what’s known as a ‘frenzy’ period. The journey itself should take just minutes, but disorientation along the way can cause the freshly hatched turtles to spend hours crawling through the sand. ‘What prompted our study was the desire to understand what happens to these hatchlings after they spend hours crawling on the beach because they are disoriented,’ said lead author Sarah L Milton, PhD, associate professor of biological sciences in Florida Atlantic University’s College of Science. The team observed 150 hatchlings collected just as they emerged from nests in Palm Beach Country. The hatchlings came from 27 loggerhead turtle nests and 18 green turtle nests, and were released back to the ocean shortly after. To study their movements, the researchers used tiny enclosed treadmills. Sea turtle hatchlings are thought to follow the brightest low horizon to get to the ocean – so, the researchers simulated this lighting to guide their path. 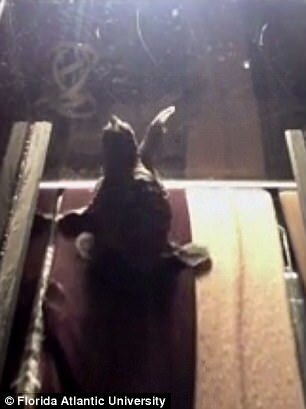 After walking on the treadmill, the hatchlings were fitted with a tiny swimsuit and placed into a small tank, where the team measured their breathing rates and stroke rates. 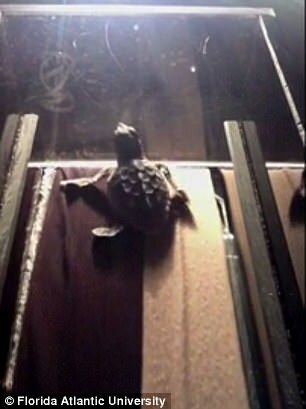 After walking on the treadmill, the hatchlings were fitted with a tiny swim suit and placed into a small tank, where the team measured their breathing rates and stroke rates. For both scenarios, the researchers also measured their oxygen consumption and lactate accumulation. They then compared the results from both settings, revealing the lab studies matched the field studies. And, after comparing the two, the researchers were shocked to find the hatchlings were far more physically capable than previously suspected. ‘We were completely surprised by the results of this study,’ Milton said. ‘We were expecting that the hatchlings would be really tired from the extended crawling and that they would not be able to swim well. Still, the researchers warn that disorientation may have other consequences for the hatchlings. While they may be able to crawl for hours and still manage to swim, spending prolonged periods on the beach puts them at risk of being eaten or injured. 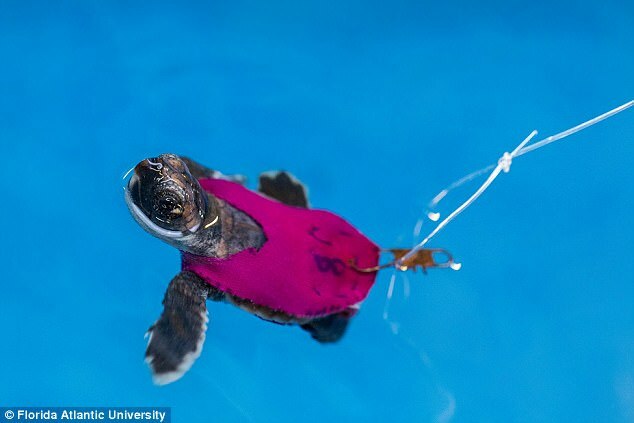 ‘One of the goals of the Florida Fish and Wildlife Conservation Commission is to reduce hatchling disorientation and our study provides the scientific basis to support lighting ordinances during turtle hatching season,’ said Milton.